Everybody got the run-off election results, right? Thanks again to Sister Miller for keeping on what’s seeming to be an endless process. Anyway, the results in case you haven’t heard: Treasure, Rita Kelso; BA, Lupe Perez; Convention Delegate, Rachel Magee (with one more to be determined at the April meeting). Congratulations to all and thank you for your continuing service to the local. So I had to go buy new general use “tennis” shoes yesterday. I went to Academy and was surprised to notice they actually had some of New Balance’s (sort of) American made lines of walking and running shoes. I went ahead and paid the premium to wear shoes with the flag under their tongues. The whole experience left me feeling wildly conflicted. On the one hand, I was happy to be able to buy a (sort of) American made product at a semi-big box store, even if that product was significantly more expensive than its Indonesian and Chinese made counterparts. But on the other hand, I kind of hated the fact that New Balance only keeps a token level of production in the U.S. (five factories) to take advantage of suckers like me. I don’t exactly feel cheated. Just baldly and blatantly manipulated. 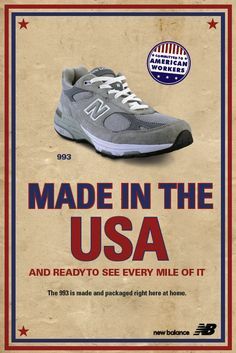 After all, the vast majority of the New Balance shoes sold in the world are not made in the U.S., or anywhere in the Global North. Like most so-called American companies, for the most part, only their upper management remains on this continent. While its marginally better than nothing, what New Balance is doing with its (sort of) American made shoes is really just marketing. It’s kind of like a carnie showing the crowd ahead of time that the two headed cow isn’t actually alive, that none of the freaks or wonders inside the tent are real. And I’m the rube who smiled and handed over my money anyway. And all of that might be okay if the damn shoes weren’t so hideous to look at. They’re mostly black with neon orange highlights. Even though I’ve been assured they’re quite fashionable, I find them downright distracting. They’re just so bright. But they sure are comfy. Again, major internal conflicts. That’s it. Except to say that it’s not looking like there’s any need for me to write that story I had talked about doing on the Atlantic City casino stagehands and their fight for fair wages. But you can get involved by joining their Facebook group at IA917.